Boho western meets global chic! Announcement Welcome to The Mode Less Travelled, where boho western meets global chic! Our products are hand-sourced and produced in small lots, and no two are exactly alike. All designs are completely original. Signature styles include leather convertible clutches, cross-bodies, zip bags and wallets. You'll also find magical feather charms, animal talismans, key chains and other small adornments. All are lovingly hand-crafted in my treetop production studio just outside Austin, TX. Welcome to The Mode Less Travelled, where boho western meets global chic! Soft suede zip bag with desert motif. 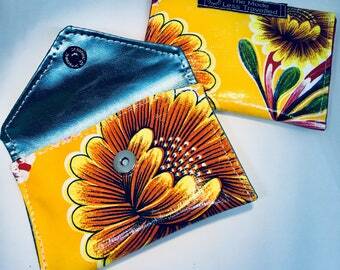 Vibrant wallet, small but mighty! Love love love this bag! It's positively beautiful and the leather smell is intoxicating. Murray was a pleasure and I got my bag in time for an early holiday gift. Will definitely be back for more- these make the perfect handmade present for those of us who aren't so handy. Accessories with attitude for adventurous spirits! Mode Less Travelled lifestyle adornments celebrate wild souls and free spirits, in functional and durable hand-crafted leather accessories. Designs are steeped in the high desert, inspired by world travels, and wear-tested on our own adventures. Every item is produced by hand under the watchful eye of shop cat Tasmania. Subtle imperfections in hides and variations in finish are part of the charm of hand-made goods. All designs are property of the artist and may not be reproduced. Tazmania oversees all aspects of production.